Heritage Shores in Bridgeville is a luxurious golf community situated in beautiful Southern Delaware. Upon completion, Heritage Shores will offer just under 2,000 single-family and duplex homes. The community is one of the largest active adult communities in Delaware and offers an enviable array of world-class amenities. Active adults will appreciate the various amenities found within the community, including the 18-hole championship golf course, which was designed by Arthur Hills. In addition to golf, residents can enjoy the amenities found at the spacious community clubhouse as well as the Fitness & Aquatic Center. A full-time activities director helps residents make the most of life at Heritage Shores by organizing community events, social clubs and local excursions. Amenities that support an active adult lifestyle are plentiful in Heritage Shores. The 28,000 square-foot clubhouse has a Grand Ballroom with a stage and dance floor as well as many recreation rooms, such as billiards and card rooms, an arts and crafts studio, woodworking shop, library, and computers. There is also a full-service restaurant, tavern, and golf pro shop. The Fitness & Aquatic Center features both indoor and outdoor swimming pools, and state-of-the-art fitness facilities which include both cardiovascular and strength-training equipment. Other ways in which residents can stay in shape is buy utilizing one of the four tennis courts or joining an exercise class in the aerobics studio. Heritage Shores' gorgeous grounds invite residents to enjoy the great outdoors. Just outside the clubhouse, residents can enjoy a challenging game at the 18-hole championship golf course, designed by Arthur Hills. The community boasts over 20 scenic ponds, picturesque landscaping and well-maintained walking paths. At the clubhouse, residents can also enjoy outdoor terraces, which overlook the beautifully designed golf course. The low-maintenance, energy-efficient homes at Heritage Shores are available in both detached single-family homes and attached duplex designs. The community was started as a joint partnership between Lennar Homes and Providence of Brookfield Homes. Today, Providence of Brookfield is the developer as well as the primary builder but some sections of the community are being developed by Ryan Homes. Heritage Shores in Bridgeville plans to encompass 1,816 residences upon the community's completion. Providence of Brookfield's homes can be found as both new construction and resale. Plans range from 1,297 to 2,807 square feet in size with two to three bedrooms, two to three-and-a-half bathrooms, and an attached garages. Ryan Homes offers a variety of floor plan options that range in size from 1,406 to 2,152 square feet. Homebuyers can select a new or resale residence that has two to four bedrooms, two to three bathrooms, and an attached garage. Lennar built a variety of home types within Heritage Shores until 2007. Offered on a resale-only basis, homebuyers can find a detached single-family home or attached duplex that typically has about 2,000 to just under 3,000 square feet of living space. Heritage Shores' residents have access to a wide range of amenities that support an active lifestyle. The community's 18-hole championship golf course, which is also open to the public, makes it convenient to play regularly, while the driving range and pro shop keep golfers in top form. Hobbyists will love the clubhouse's specialty rooms as well. There is a woodworking shop and a general arts and crafts studio where people meet for ceramics, beading, and more. In addition to the community's many amenities, residents can participate in a variety of social clubs and community events. A full-time activities director is on hand to help residents choose their activities and plan excursions. Popular clubs include card games, billiards, bible study, photo club, the Red Hat Ladies, military club, and so much more. There is plenty to do outside the community as well, including auto racing at Delaware International Speedway; gambling and horse racing at Dover Downs; and tax-free shopping at the Dover mall, local boutiques and brand-name outlets. Heritage Shores in Bridgeviille, Delaware enjoys a fabulous location that is only half an hour from Rehoboth Beach, less than 90 minutes from the Chesapeake Bay, and two hours from Washington D.C., Baltimore and Philadelphia. The community is conveniently located just one-mile south of Route 404, directly off of Route 13, making it easy to explore the surrounding area. Bridgeville and its nearby towns offer an impressive array of recreation. The rich historic area of Southern Delaware is home to many arts and cultural attractions, including the Nanticoke Indian Museum and the Governor Ross Mansion and Plantation. With Heritage Shores' proximity to ocean, bay and freshwater lakes, residents can find plenty of water-based activities like dolphin watching, canoeing, boating and fishing. 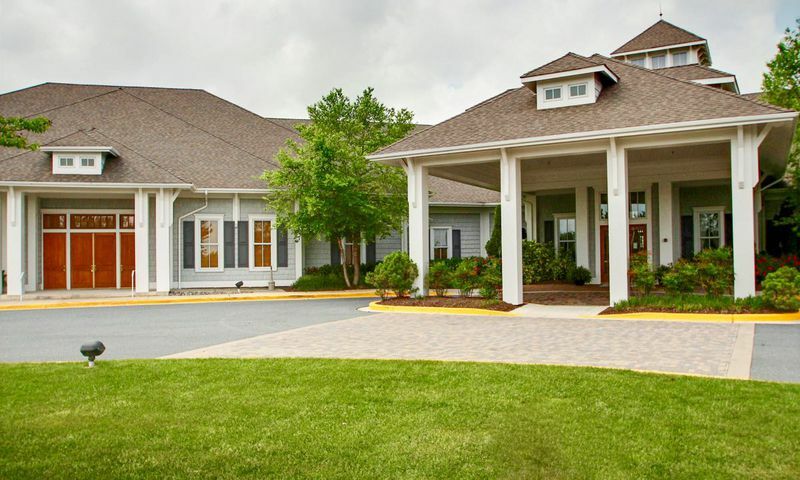 Heritage Shores is a wonderful age-restricted community in Sussex County, Delaware that welcomes 55+ homebuyers with fabulous amenities, low-maintenance homes in a desirable location. Heritage Shores Club - 28,000 Sq. Ft. There are plenty of activities available in Heritage Shores. Here is a sample of some of the clubs, activities and classes offered here. Providence of Brookfield's homes can be found as both new construction and resale. Plans range from 1,297 to 2,807 square feet in size with two to three bedrooms, two to three-and-a-half bathrooms, and an attached garage. Lennar built a variety of home types within Heritage Shores until 2007. Offered on a resale-only basis, homebuyers can find a detached single-family home or attached duplex that typically has about 2,000 to just under 3,000 square feet of living space. Please Note: Not all floor plans are available at this time. Beautiful & stunning clubhouse. Lots of amenities to stay busy. Delaware is great and has much to offer! Beautiful entrance leads to the clubhouse. You'll love it from the first impression. Pickleball courts are nice and the golf course was just updated! We had a wonderful experience moving from Northeastern Pa. We have found living at Heritage Shores a delight. The people are very friendly and helped us get acquainted with our new surroundings. There are many things to do here with many different activities to choose from. I highly recommend Heritage Shores as a great place to live. We would recommend 55places to anyone who is interested in moving to Delaware. Our 55 Places Partner Agent was very informative and was there for the walk through and closing of our home. We are happy with our new Ryan home at Heritage Shores in Bridgeville, De. The Sales, and Project Managers couldn't be more helpful. Love the location and the value. Just bought a condo here last year for under $230k. I wanted something new that didn't require any annoying maintenance. I've spent way too many years worrying about house maintenance! I just wanted to relax and feel like I lived in a resort. Heritage Shores is great and I would highly recommend it! 55places.com is not affiliated with the developer(s) or homeowners association of Heritage Shores. The information you submit is distributed to a 55places.com Partner Agent, who is a licensed real estate agent. The information regarding Heritage Shores has not been verified or approved by the developer or homeowners association. Please verify all information prior to purchasing. 55places.com is not responsible for any errors regarding the information displayed on this website.